Infusing creativity and clear thinking into marketing, design and creative process. You have a grand vision for changing your organization, evolving for a new business world that is changing whether you go along for the ride or not. Inspired by possibilities, you rally a team to set change in motion. Then you hit a brick wall. People don’t get it, or they think they do and they oversimplify the problem to kill your idea. So you switch to persuading, making your case, sharing metrics and quotes and it goes on and on and you still end up with the same reactions. Does it sound familiar? Don’t negotiate with this kind of obstructionism. Don’t be hostile either. Don’t become cynical. Don’t subvert people. Don’t do anything you might be tempted to when you’re frustrated and your ego is hurt. Take a step back and realize that immediate resistance to change is not generally rational. It’s not actually policy your detractors want, it is vision. Don’t give them what they’re asking for, keep giving them what got you motivated in the first place. They need someone with a vision – and it doesn’t need to be boisterous or forceful to be compelling. Just tell a powerful story and stand up for it. Don’t be defensive, just paint more pictures. Keep telling the story. Be a broken record. Job descriptions often call for individuals possessing a “strong bias for action”. Businesses almost always need more execution-focused employees. 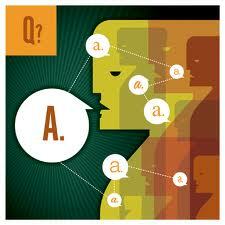 So it is natural that we shape the way we talk and interact with co-workers according to this ideal. One way we portray ourselves as driven by an urgency to act is to speak in simple and punchy generalizations that help summarize massive amounts of information and make it look as though the path forward, what should be done in response to the information, was almost obvious. Sometimes the path forward is clear, but not always. At least once a year, if not once a quarter, we need to practice the discipline of self-doubt, questioning, putting it all on the table. Deconstruction is one of the most constructive things I do personally and professionally. Our company culture asks us to move quickly, especially during difficult times, but we also tend to make hasty generalizations and decisions simply because we’re sitting in a meeting full of puzzled looks and someone has to step forward and cast a vision for the road ahead. But because they are so far-reaching and simple, generalizations can cover much more important and complex internal and external environmental factors that should be factored into our strategy. It’s important we’ve thought deeply about those generalizations ahead of time and in great detail. Yes, we have to speak concisely and make blanket statements. But had better do our homework beforehand. That’s where deconstruction comes into play. Not everyone has the patience for it, but good leaders must thrive off of it. The only way to refresh your strategy is to have the ability to pull it apart and see it for what it is. Without maintenance, the machine becomes obsolete, fragmented, confused and falls apart. Action determines whether we move forward, but strategy determines where we’ll end up. So which is more urgent? We all have our defaults, some more cemented than others. It seems that one of the most common defaults we all have is how we respond to challenges. The three default responses tend to be either: revise, improve or hold. The problem is, our preferred way of tackling a challenge is not always the best response. As a universal rule, any one of these on its own would be disastrous. Constantly revising the fundamentals is a recipe for insanity. Constantly striving to improve things that are inherently finite in their capacity for improvement will drive you crazy too (while wasting a lot of your time). Clinging to the obsolete breeds mindless, mechanistic stagnation. So what would happen if we embraced each situation on its own merits, soberly and patiently facing its unique attributes? If we were to discipline ourselves to practice such delicate respect for nuance, we would see entire industries revolutionized. If we approached our own lives with this level of care, what then? There are a limited set of life-creating patterns that must be followed for systems and the people within them to thrive. One of these patterns is walls, without which it is impossible to maintain the complex relational harmony among successive internal layers. In an ecosystem, an organism, a cell, a building design, or an org structure, there are smaller, more nuanced and specific groups the further down you go. Groups are formed and hold together by distinct delineations (walls) of where one ends and another begins. This is a continuation of a previous post in which I touched on how cells retain a distinct membrane of separation to limit the kinds and levels of interaction that can take place between the internal and external environments. In a healthy cell, the necessary and beneficial ingredients needed for their function are kept in, while useless or harmful stuff is kept out. The term for this is selective permeability. Cell membranes keep stuff that is too big from entering the cell. That is to say, an effective team doesn’t intake a resource, function or responsibility that exceeds its size. The membrane also regulates frequency. How often do we fail to standardize and control what comes in and out of our business units? Not only that, cells contain channels and transporters that actually have fairly specific molecules they are designed to pass in and out of the cell. If you can’t do it well or you are not “shaped” to take on the task, decline emphatically. If you are ideally designed for the job, stop at nothing until you get it. Aligning scope/scale/frequency and core competencies with inputs and outputs are the essential decision points for any healthy cell establishing its role within a system. Agility is impossible without this level of focused selection. But so far I’ve mostly pointed out the utility of the cell membrane. The cell is only in the crudest sense like a machine. Let’s not forget: machines imitate cells, not the other way around. By my analogy of the cell I am actually suggesting something much deeper than controlled systems. The cell membrane also creates a local environment for direct and rapid exchange. Even in a business context, this is more than just the passage of information. Having a defined functional, structural, financial, cultural and even spatially defined limit to your team is a critical pre-condition to feeling psychologically oriented as individuals and united as a group. This directly impacts our motivation, focus and outputs. Place matters and the organization as a whole must support and respect these boundaries, giving teams the right to keep out inactionable meetings, unfocused conference calls, irrelevant metrics, wasteful spending, rabbit trails, meaningless corporate speak, bureaucratic sloth, pet projects and so on. 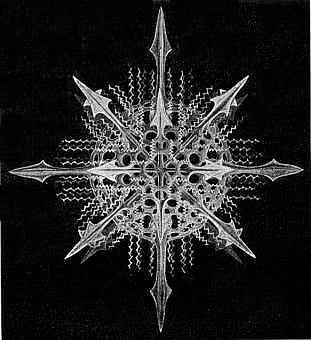 My central observation is that, for a group of individuals to produce life, to create a sort of musical harmony, to create unique and irreducibly complex instances of life, they absolutely must be selective, located, centered, protected, walled in. In one post I can’t possibly exhaust the analogy, but I hope I’ve touched on some aspects that invite your imagination. This post is more a scratch pad of clustered observations. If you are intrigued as I am with the magic that happens with life is allowed to flourish at a small scale within a broader system, consider strong emergence theory in this context for future reflection on the magic of protecting teams. Christopher Alexander elaborates on the application of boundaries, walls, transition areas and centers to designing cities, building, homes and all sorts of spaces in A Pattern Language. It’s quite a fascinating work. 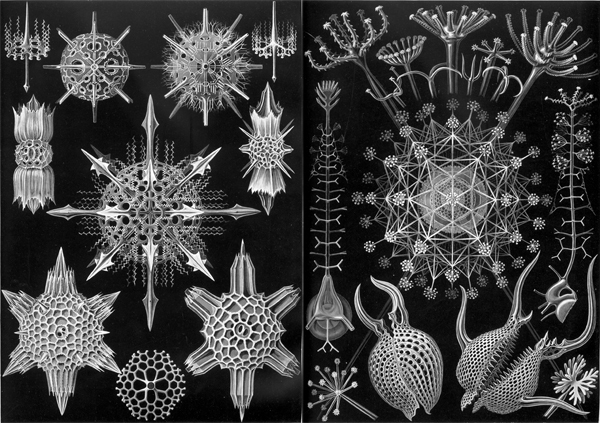 Lychnaspis Miranda; one of Haeckel’s incredible drawings of Radiolaria. In designing places for human use or art meant for orienting the human psyche, size and emphasis have an inverse relation. This is one critical element of balance. Well-designed visual elements have a psychologically orienting effect on the viewer, which is something we’re usually only aware of when disoriented by a poor design. If we pay careful attention, we begin to notice there are certain patterns unifying the scenic gardens where we long to escape to, the paintings that we dream of entering, and the house that somehow felt more like home than our own. One pattern expressed in almost every aesthetically pleasing context is that of a gradient of relative weight or emphasis amongst visual elements in a design scenario. This is a brief introduction to a theory and formula aimed at expressing the qualities of this gradient to the best of my current ability. Here’s the basic idea: The larger the space/object being modified within a design scenario, the less weight/emphasis* should be assigned to it. The contrary is true. The smaller the space/object, the greater weight/emphasis should be assigned to it. The relation between variables is one of infinite exponential regression. So one can reference the formula regardless of the size of the component being designed. Here’s how I envision it’s application: When size ratios among spaces/objects (or visually distinct parts of objects) in a given design scenario do not or cannot align perfectly with the golden ratio, one can still follow the plot line for an approximation of the balanced degree of weight/emphasis to assign to it. When establishing relative scale for size (X axis), begin with your medium itself as the largest value. This provides the maximum X plotting point. This is consistent with the conventional design methodology of executing visual hierarchy using tiers of increasingly complex detail; of starting with the basic, over-arching elements and drilling down the detail more gradually. Weight/Emphasis is challenging to quantify; the most important metric is internal comparison/contrast to other objects/spaces in the design. Establishing relative scale for weight/emphasis (Y axis) could start with either the smallest accent elements or with the largest (lying most in the background); it is probably more common and less problematic to decide on the larger background elements first and work towards the smaller/accented elements. Due to the nature of the gradient, it is far easier to inadvertently underemphasize accent elements and overemphasize background elements. Conversely, it’s difficult to overstate the accents and to understate the background. Here’s my first attempt to provide supporting rationale for the idea: Large objects gain emphasis simply by their size. This bias must be offset by decreasing other attributes that create emphasis/visual weight. Also, if the majority of the medium itself is dedicated to emphasis, the viewer lacks visual direction or focus. The effect of noise, while occasionally surprising, lacks the grace and restraint to attract continued interest over time and deepened respect for the thought and intention put into the work. Noise feels lazy and perhaps arrogant. The same can be said of overcompensating for a bad design by excessively enlarging the design to draw the attention of the viewer to the impressive scale. This is a generalization, of course. Some simpler designs, with the modest beauty of restraint, can be optimally executed at a large scale. But again, this goes back to the point of offsetting the impact of size by reducing other attributes that create visual weight. Aesthetically, viewers generally benefit from visual hierarchy. Whatever the medium, hierarchy usually benefits a work, when done with care and not with random or thoughtless rigidity. Smaller objects (x) are easier for the human eye to apprehend at one single moment. We can instantly fixate on the beautiful eye in a painting, but must gradually scan the landscape in the background. By accenting smaller elements in a design, we can see where the gems or special diamonds are in a piece. One qualifying point must be made about accented elements. While occasionally described as being the focal point of a design, this does not entail that the accents are the most important or demand the most time and attention. It’s simply that our eyes move fluidly and naturally return to these prominent elements. Medium sized objects (1.618x) help “present” or “stage” the smaller elements in the design. A tree next to a farmer, a table upholding a candlestick, clouds enshrouding the sun. These are crude examples that quickly come to mind when thinking of “medium” elements that stage or present the central accent elements of a piece. Large objects (1.6182x) provide the base, the background and the sense of primary context. The term “background” is used figuratively; large objects do not necessarily have a location behind other elements. The term “background” is chosen because it is, in a sense, oriented around and attends to the other elements in the design. The term “base” is used for chemical reference. As a base, the larger objects don’t necessarily create the “reaction” that catches our attention; however, without the proper base, the chemical reaction is often not attainable or at least is suboptimal. Lastly, a few thoughts on the inter-relationship among the large background elements, medium supporting elements and smaller accent elements. This is the most difficult aspect to discuss with any intelligibility. One can talk about how the dark velvet drapes in the background provide a beautifully solemn contrast to the bright red waxen apple on the table in the foreground, and how the ornamented pedestal table with its rich dark brown finely polished oak and solid construction provides an excellent “medium element” to present the red apple to the viewer. These comments, however general, make sense to us intuitively. But it is nearly impossible to map out the possible abstract and even epistemologically pre-linguistic connections the human mind can perceive in a work of art. It is even more difficult to imagine what these connections mean, both subjectively and objectively. * Weight/Emphasis is taken to be the combined effect of all variables in design that serve to distinguish an element from its surroundings. Color (hue, saturation), size, shape, contrast, stylistic elements, texture, dimension, light, movement, patterns, orientation, alignment, positioning etc. etc. … Which is all the more reason to give greater attention to the subtleties involved in addressing X. We are all tempted to normalize mediocrity. It is easy to dismiss common, pervasive, daunting problems in this way. In our personal lives, the problems that feel to big to conquer, to complex to work through are usually the ones holding us back from meaningful growth. The same seems to be true of organizational sociology. Just as with personal identity, organizational identity is formed by the aggregation of thoughts, words and actions of the organization. Over time, we begin to see the good, the bad and the ugly in our company and, unless challenged, these beliefs and attitudes cement and preclude the possibility of change. So the next time “group think” takes over a meeting and demonstrates collective denial of a problem (and a possible solution), intervene! Your own future is at stake. The behavior of cells provides a pattern for organizational growth that is, as far as I can tell, unrivaled. When a cell reaches a certain size, it naturally splits in two. There are no meetings, no bureaucratic stages of approval. The brain does not need to sign off on the activity of cell division. Yet, despite this split, the synergy between cells remains in tact. Tissues form through a common structure, composition and function, just like teams within an organization. And this synergy extends beyond tissues. Regardless of how much cells split and multiply, they coordinate to form organs and organs in turn harmonize with one another to form systems. Despite the complex relational harmony of the cell with its neighbors, it retains a distinct cell membrane of separation to limit the kinds and levels of interaction that can take place between the internal and external environments. We need more teams that imitate animal cells. We should strive to imitate their delicate balance of preserving the distinctness of the parts with the unity of the whole. Without walls providing a degree of insulation, we lose drive, team camaraderie, focus, and that distinct inertia that happens when collaboration is free to happen through face-to-face personal relationships.